I’ve mentioned before on this blog that I am rather fond of Jane Austen’s stories. I think they’re so lovely and clever and important. Sometimes, though, her six novels just aren’t quite enough. 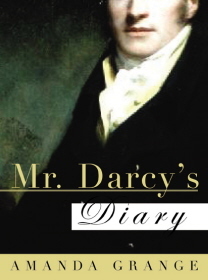 Mr. Darcy’s Diary presents the story of the unlikely courtship of Elizabeth Bennet and Fitzwilliam Darcy from Darcy’s point of view. This graceful imagining and sequel to Pride and Prejudice explains Darcy’s moodiness and the difficulties of his reluctant relationship as he struggles to avoid falling in love with Miss Bennet. Though seemingly stiff and stubborn at times, Darcy’s words prove him also to be quite devoted and endearing – qualities that eventually win over Miss Bennet’s heart. This continuation of a classic romantic novel is charming and elegant, much like Darcy himself. I really really really like these books. Amanda Grange has written each of Austen’s novels from the lovers’ perspectives, which is basically exactly what you would expect them to be–aka glorified fanfiction–and it’s so good. I may be a pretentious English major, but I can also take a lot of pleasure from cheesy, romantic stories, so long as they have decent grammar and involve characters that I love. These novels check at least one of those boxes (jk they check both).